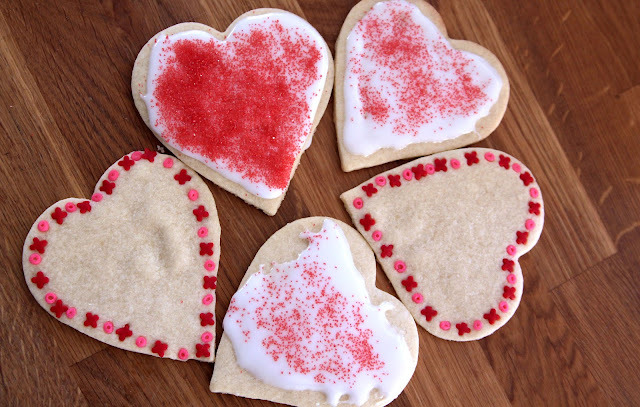 The girls and I made a new cut out sugar cookie recipe for Valentine's Day. We found the recipe at Sally's Baking Addiction (LOOOOVE the name!!!!) and she links her icing for this cookie at AllRecipes.com. The girls LOVE the icing recipe. Me? Not so much. I'll look for another icing next time. I've been dying to try my hand at flooding cookies!!! Our girls wanted spaghetti and meatballs for dinner tonight. I've been making this recipe for EONS and we still love it!!! Mr U thinks it's the best. Combine crushed saltine crackers, garlic powder, parmesan cheese, salt, and dried parsley. Stir in milk until all ingredients are well combined and let sit about 5 minutes or until crackers are soft. Mix in ground beef and combine it all together (I find using my hands is easiest). Form into meatballs and place in a prepared (sprayed with nonstick cooking spray) 9x13 baking dish. Bake at 350 degrees for 30 minutes and then take out and turn meatballs over and cook 10-15 more minutes until meatballs are completely cooked. This makes 30 one inch meatballs. But that's just how we like them. Some of y'all may prefer to make them larger. No matter what size, they are GOOOOOOOD!! Oh and FAVORITE sauce is Del Monte's Four Cheese Sauce. SOOO good but getting hard to find these days!!!! What are y'all having for Valentine's Day at your house??? Yum... I like to make a large batch of meatballs and put them in the freezer. 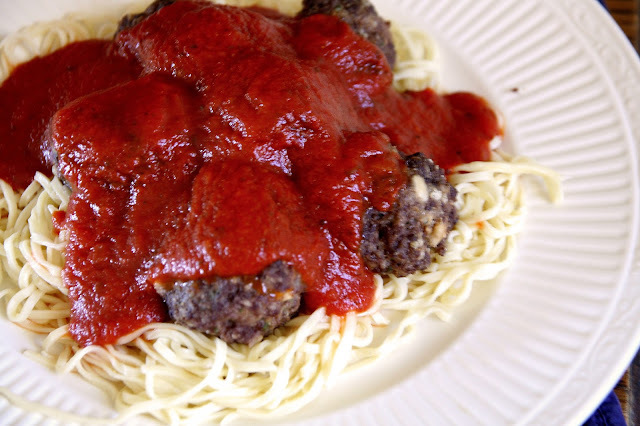 It makes for a fast dinner of spaghetti and meatballs. Hubby delayed his start time this morning to stay home and make us heart shaped pancakes. Love that man! Tonight I will make our traditional v-day meal of lasagna and sugar cookies for snacking while we play a game of conversation hearts bingo. Conversation hearts Bingo!!! LOVE THIS!!!!! What a great idea!!!! He is so sweet to make heart shaped pancakes for y'all!! Dear man!! Thanks for visiting, Donna!! Happy Valentines Day to you, too! !